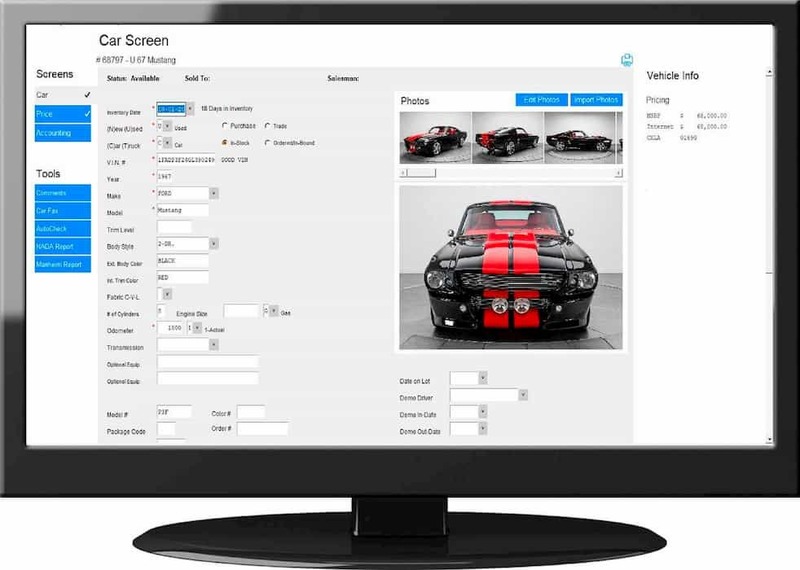 Dealership Management Software brilliantly designed from the car dealers perspective. Zeus Inventory is the most comprehensive and easy to use Inventory package on the market today. Load a vehicle using VIN Decode and send vehicles to inventory web sites. Print all inventory forms such as your buyers guide, deal jackets, window stickers, key tags and wash-out sheets. Create reports for specific models analyzing the rate of flow, gross profit, floor costs, etc, and maintain an electronic police book/purchase log. The Zeus Software includes sales, desking, and finance that offers the speed and versatility necessary to desk and deliver a vehicle in just a matter of minutes. Sell to any type of customer whether they are paying cash, applying for financing, leasing a vehicle, or they are a wholesale customer. Zeus will calculate taxes nationwide including when you sell accross state lines, and with all of our integration tools, enter the information once, and from there run credit, submit to DealerTrack or Route One, register the vehicle through CVR or Vitu, and send to accounting. Register and title the vehicle and print all necessary forms for either in state sales or sales across state lines. Zeus also has the ability to submit an electronic registration directly to CVR, Vitu, or Dealertrack. Zeus Buy Here Pay Here is the most user friendly and comprehensive software on the market. Enter the customer and set up the schedule then print all necessary forms. 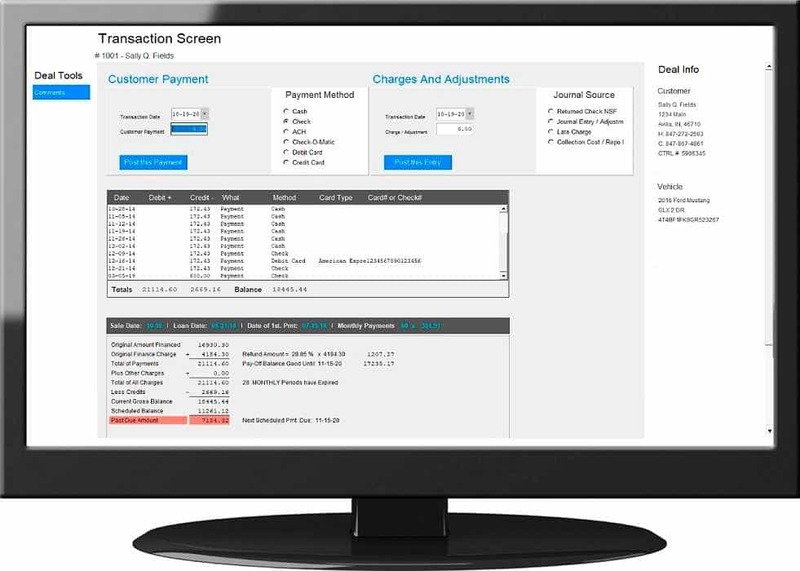 Within your dashboard, view the entire account history in one easy-to-read screen, enter payments quickly and easily print receipts. Zeus will print everything and we place no limitations as to the types nor quantities of forms that can be printed. If it makes life easier, Zeus will do it. Zeus also has a Printing Autopilot for all PDF documents. With a simple click, Zeus will create a booklet with all of the necessary contracts, state forms, riders, delivery forms, and others that can either be printed or emailed to the customer. Zeus has the most comprehensive and analytical reports available to the discerning automobile dealer. We give you the information necessary to run your business effectively and profitably. Who is performing? Which models are selling? What advertising source is bringing in the customers? Which finance source is performing the best for my dealership? Questions lead to answers. Answers lead to results. Results lead to increased sales. With Zeus, we strive to give you the answers to questions that you may not even have thought of asking. Zeus has fully integrated easy to use Menu Selling. 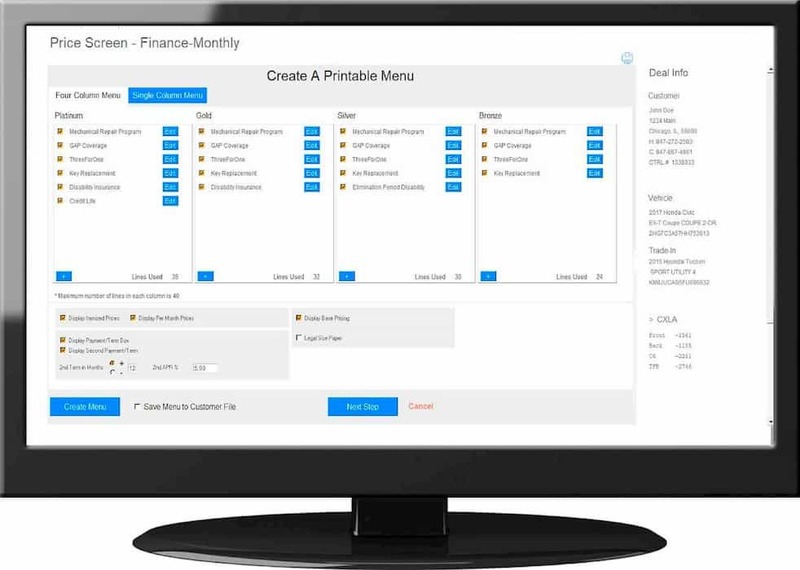 Designed to work the way Sales and F&I Managers need it to work, the Zeus Menu puts the power of selling and creating more profit in the hands of the dealer. Copyright(c) 1985-2019 Zeus Concepts, LLC. All rights reserved.